Two weeks prior, Manchester City were played off the park at the Camp Nou. As matchweek 4 rolled into town, Pep Guardiola was determined to gain revenge - and that's exactly what happened as the Citizens stunned Barcelona in the highlight of yet another incredible night of Champions League football. 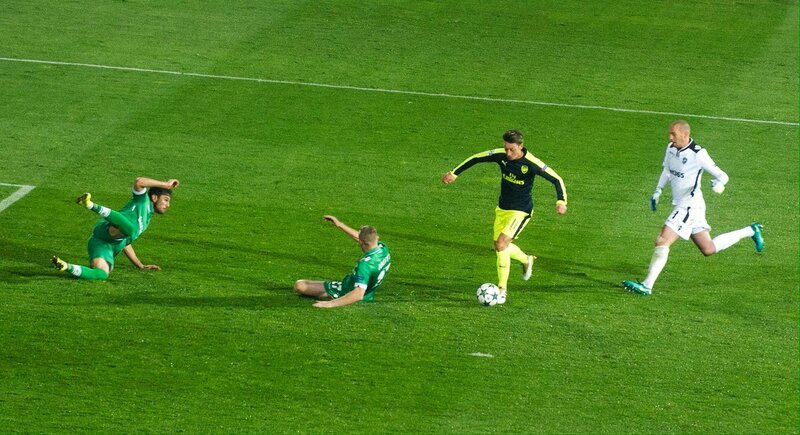 Also on the bill was Arsenal, who appeared to be on the verge of a humiliating loss to Ludogorets, but were saved through a mouthwatering piece of magic by Mesut Özil. Adding on to that was a last-gasp winner from Antoine Griezmann, with some controversy over the offside call which was proven to be right retrospectively, while Lewandowski similarly grabbed a brace as Bayern ensured there was no giant killing in Eindhoven. The search for wonder goals needed to stretch no further with Hamšík and Meunier adding to Özil's on the night. As we have done throughout the Champions League - and the last two seasons - we run down all the action from the eight games on 1 November 2016. Pep Guardiola's Manchester City exacted revenge on Barcelona as they shut down the likes of Lionel Messi and Neymar with a sensational victory in front of their home support. Raheem Sterling had a major penalty appeal in the early stages but instead would cut a bewildered figure when he received a yellow card for simulation from Viktor Kassai. A closer look would show he was indeed clipped by Umtiti, and the hosts had a right to feel hard done by. An electric counter-attack would tear through Manchester City's defence in the 20th minute, finished off easily by Lionel Messi who rolled it into the corner past Caballero. From the defence, Messi picked it up and send Neymar surging down the left flank, as the Brazilian weaved into space and knocked it back to his teammate who took it past a defender before the finish. A masterclass in counter attacking football, with Guardiola once again backed up against the wall. With around six minutes before the half-time interval, Barcelona would be punished for an uncharacteristic display of complacency. Manchester City's pressure resulted in the ball being played across goal, where Aguero pounced and fed Sterling, rolling towards Gündoğan who drove it in meaning things were all square. They could even have snatched the lead with Fernandinho and Silva linking up before the former knocked it just wide - as Aguero was just inches away from directing it in. Having looked so sharp to open the game, Barcelona were now looking mortal and their opponents would capitalise. They would come unhinged at the hands of a magical free-kick by Kevin De Bruyne, sending it flying into the top right corner and handing City the lead. What followed was a frantic but thrilling sequence of chances, shots fired wide and a few signs of Barcelona's revenge. The Etihad Stadium would come unglued after the midpoint of the second half as the Citizens took a two-goal advantage through İlkay Gündoğan. De Bruyne split the defence to find his man on the right, where a cross towards Aguero was fumbled, but the German came running in to smash the loose ball. 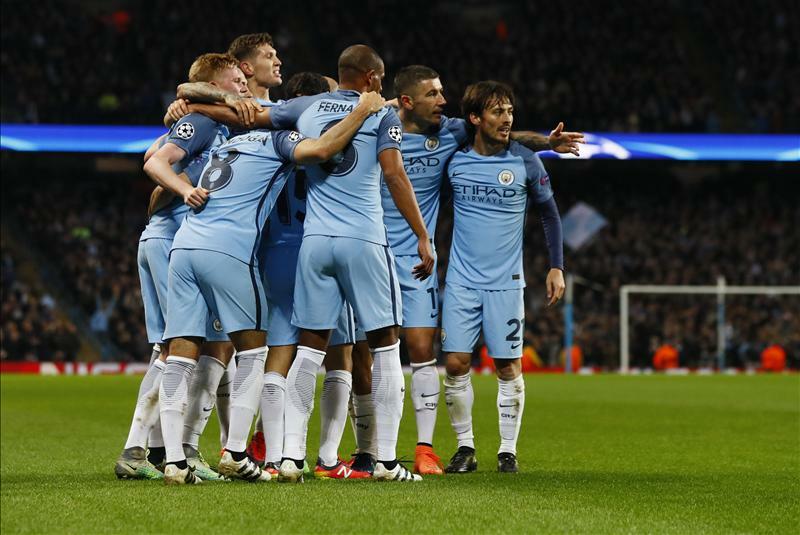 Manchester City composedly strolled to the full-time whistle to finish off the feat. 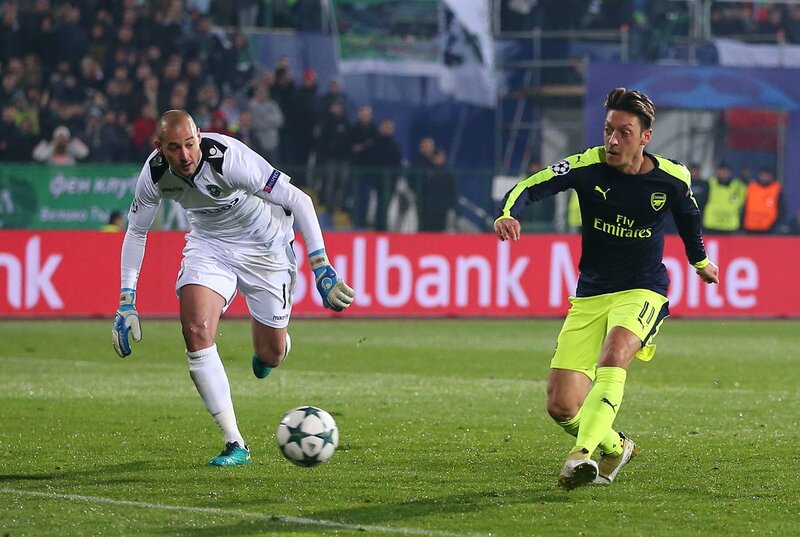 Mesut Özil produced an out-of-this-world individual goal to send Arsenal into the knockout stages of the tournament after coming from two goals behind. Arsenal endured a disastrous start when Jonathan Cafu bundled in a messy set-piece past Ospina as Ludogorets broke ahead, with the memories of the thrashing in the first fixture now long gone. Scorer then turned provider as Cafu drilled a low ball past goal where Claudiu Keșerü clinically knocked it past the keeper and dumped the Gunners into turmoil. Urged to dig themselves out of the ditch, Granit Xhaka produced his first ever Champions League goal as he rifled in from close range to spark the comeback. It was worked well around to the Swiss player, whose goal made things uncomfortable for the hosts. Arsenal would have things reset well before the half was out after Olivier Giroud lifted his header over the keeper after a cross deep on the right from Ramsey. Arsenal had clawed themselves back into it and had their opponents reeling. A piece of magic from Mesut Özil in the late minutes would hand Arsenal the victory, as they powered through to the knockout stages surviving a scare. The German crafted a masterpiece as he was found all alone at the top, taking it over the keeper then humiliating two defenders before he rolled the ball into the back of the net. Robert Lewandowski's double helped the German champions recover from an early PSV goal in the Netherlands. Bayern Munich made a hot start as Thomas Muller scooped it wide before Robert Lewandowski clipped the woodwork, but they were in for a shock when after 14 minutes Santiago Arias headed past Neuer. A gladiatorial shift from Ramselaar, who kicked away with some amazing running to set up the goal eventually fell out to Arias, offside but not called, to head it in. Recovering from the shocks, the German champions would turn to their most prolific resource. 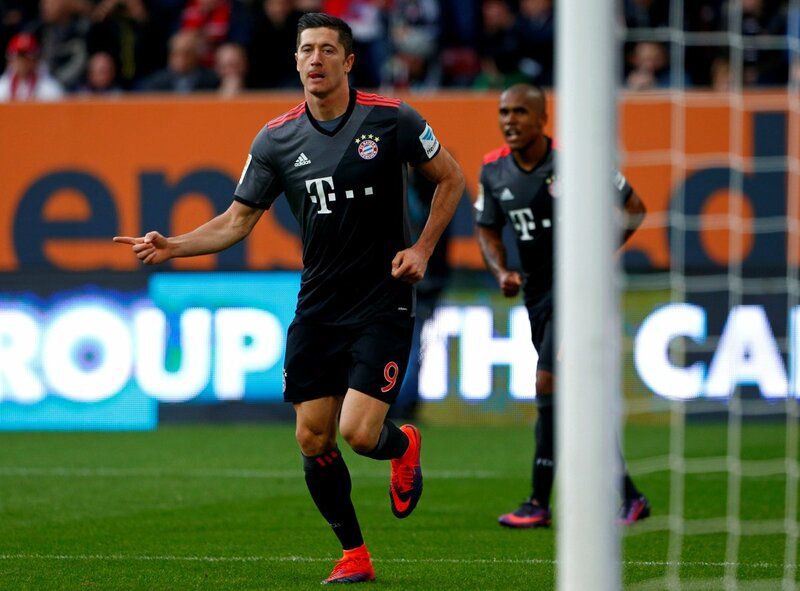 Robert Lewandowski came close with a header before stepping up to the penalty spot where he calmly got the better off the keeper to level the playing field. David Alaba was the craftsman for the ultimately winning goal, as his cross would find the Pole who netted at point blank range. Bayern Munich had came out eventually unscathed, but were at times stunned by the challenge presented by their Eredivisie counterparts. Antoine Griezmann's last-gasp goal which was eventually given after much deliberation kept Atletico's perfect record in the campaign as they saw off Rostov. Antoine Griezmann executed a stunning flick on the turn to score his first Champions League goal of the campaign, after a ball over the top was headed back by a defender. But in the aftermath, there would be little celebrations as a lightning-fast response allowed Rostov to equalise through Azmoun. It was a four on two, where Azmoun was able to break through and slip it past the keeper. Just as it appeared it would finish a 1-1 draw, Antoine Griezmann produced another delightful flick in what was a fantastic piece of refereeing by the linesman. Griezmann initially believed he was offside as the header came after the run, but as things would turn out it came off a defender's head meaning the goal would stand and it was yet another triumphant night at the Vicente Calderon. 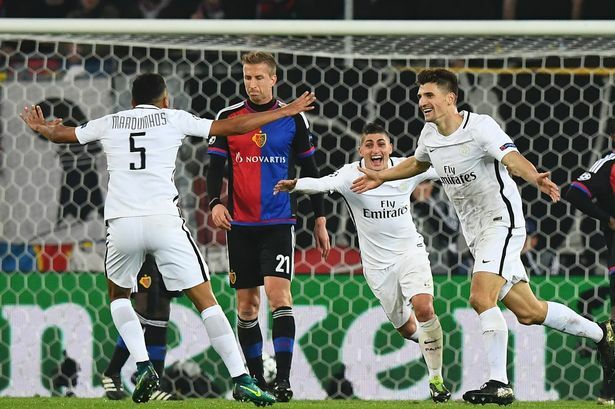 Paris were finding things frustrating for the most part as they were unable to break the deadlock right until the 43rd minute, where Matuidi guided Meunier's shot into the net after it chaotically rebounded through the traffic. But 15 minutes from time, the Ligue 1 kings were dealt an almighty setback when Zuffi's intended cross ended up floating into the back of the net, meaning the business was far from done in Switzerland. It would take something special to eventually win the game and that came through Thomas Meunier. The Belgian caught on to a cross from outside the box and connected with a spectacular volley just inside the post to win the game in amazing fashion. Marek Hamšík's stunning equaliser helped Napoli regain a point for their efforts on a long away trip to Turkey. Istanbul was the focal point of the action a couple of hours before kick-off for the rest of the games as Beşiktaş played host to Napoli after a five-goal thriller a fortnight ago. Atiba Hutchinson struck the woodwork to create some early jitters at the half-hour mark, although nothing would come with a deadlock spanning nearly 80 minutes. Maksimović was penalised for the referee for a handball on Aboubakar's cross, handing a penalty to Ricardo Quaresma who swept in past Reina to put his team in front. That lead would be short-lived though due to a swift response from the visitors. Captain Marek Hamšík nailed a curled effort round the keeper after being set up by Mertens to spectacularly level the scoreline, and following a tense finale, claw a point back for the Italians. Mönchengladbach and Celtic shared the spoils in Germany after a goal on either side of the half-time break. Stindl's volley after half an hour meant the Bundesliga side were in front for a large chunk of the game, but Korb's foul not only reduced his team to 10 men, but also cut their lead as Dembele scored from the spot to make it 1-1. Benfica survived a second-half penalty as Salvio's successful conversion helped them to the win in Portugal. He converted from the spot in the stoppages, with Guedes coming close later, but things were nervy when Junior Moraes stepped up with a chance to level the game - that was stopped by Ederson. The German proved how effective he can be when on those forward runs and the rewards were really reaped against Barcelona. He was the crucial difference in winning them this huge fixture.